How To Use ReadSpeaker - Our built-in text to speech facility. You can select a part of the text (by clicking and dragging over the text) that you want to listen to and then press the pop-up Listen button that appears next to the mouse pointer. When you click the pop-up Listen button, an audio player appears (see the image below) and ReadSpeaker starts reading the text you have selected. Turn ON the 'enhanced text visibility' option - this will display large subtitles of the text being spoken at the bottom of the page. Make sure the 'Pop-up button' is ON - This allows you to select specific text to read by selecting it with the mouse. Choose whether you want to have the text highlighted while read. Choose a large 'subtitle' display of highlighted text - the 'enhanced visibility' option. 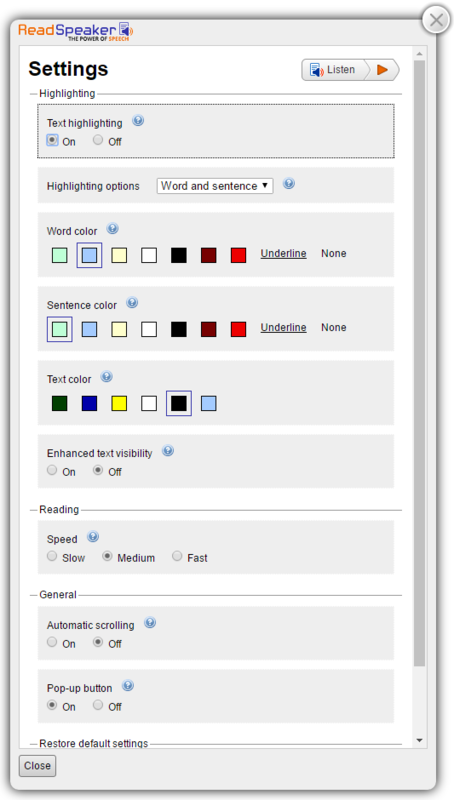 Choose whether you want the text highlighted on a word and sentence basis, sentence only, or word only. Choose style and colours for the highlighting. Choose whether you want the reading speed to be slow, medium, or fast. Choose whether you want the page to scroll automatically to follow the highlighted text. Choose whether you want the pop-up Listen button to be shown when text is selected. This website has been equipped with 'docReader' technology. This means that nearly all documents on this website are able to be read aloud and converted into an easy to read format. The document reader will not work with non-Council documents that are actually hosted on external websites. The document will open up in a new window. You can also select specific text to be read by dragging the mouse over the text and clicking on the listen button that pops up. Bathurst Regional Council is committed to ensuring greater website access to all customers. This includes providing access to our programs and services for people with disabilities. We are aiming to ensure that wherever possible, our website complies with the Web Content Accessibility Guidelines developed by W3C. Where our website site links to external sources or utilises third party software applications, accessibility can unfortunately be compromised as these resources are beyond our control. If you have any concerns or questions about the accessibility of our website please feel free to provide us with your feedback. You can also contact us to arrange the required information to be presented to you in a way suitable to your needs. If you would like to speak with staff of Bathurst Regional Council in your first language, please telephone the Translating and Interpreting Service on 131 450 (local call anywhere in Australia) and ask to be connected with Bathurst Regional Council.